This time it was a really easy DIY recipe. The only thing I did was boil the eggs and gently crack the shells. After that it was basically marinating the eggs with color and flavors. 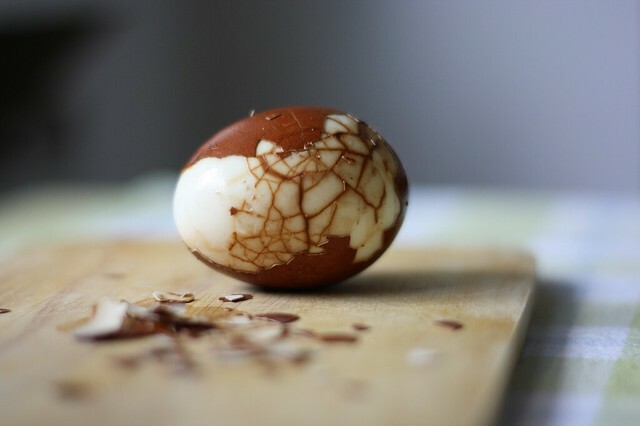 The end result is really beautiful, the eggs look great. The picture above was after one day of steeping. Wikipedia also suggests two days. So they can look even better if you are a bit more patient. The taste of the eggs on the other hand isn’t that special in my honest opinion. You slightly taste the spices at the edge of the eggs. But the yolk still tastes the same. Like I said, I only tried one day of steeping. So maybe that will also improve with two days. And besides that I will also suggest to try and experiment with other spices. First boil your eggs for a couple of minutes in a pot. After that remove the eggs from the pot and gently crack the shells of the boiled eggs. Add the rest of the ingredients to the water in the pot. Add the eggs and simmer for about an hour. This is to marinate the eggs with the spices and tea. After that you can let it cool down.